FABAtv is your online destination for face and body art classes. Whether you are new to face painting, a professional body painter, or even a magician, FABAtv has classes you want to watch. Take a class from the comfort of your own living room with fantastic instructors like Mark Reid, Lynne Jamieson, or how about Athena Zhe who was on Season 2 of Syfy’s hit reality show, FaceOff. FABAtv brings all the best instructors under one roof and gives you the key to access hundreds of classes and workshops from them! Subscribe today! Not quite ready for a subscription? Not to worry! FABAtv has been satisfying the urge to learn of face and body painters everywhere for over a year now with free & live classes every month! August’s free & live class is being hosted by none other then Margi Kanter! Margi Kanter came to the FABAtv studios for her live face painting class all the way from Chicago! Back in Chicago Margi runs her face painting business, Making Faces Chicago, and is known for the animated faces she paints! If you run into Margi on the street you will be greeted by her energetic smile and loving nature. 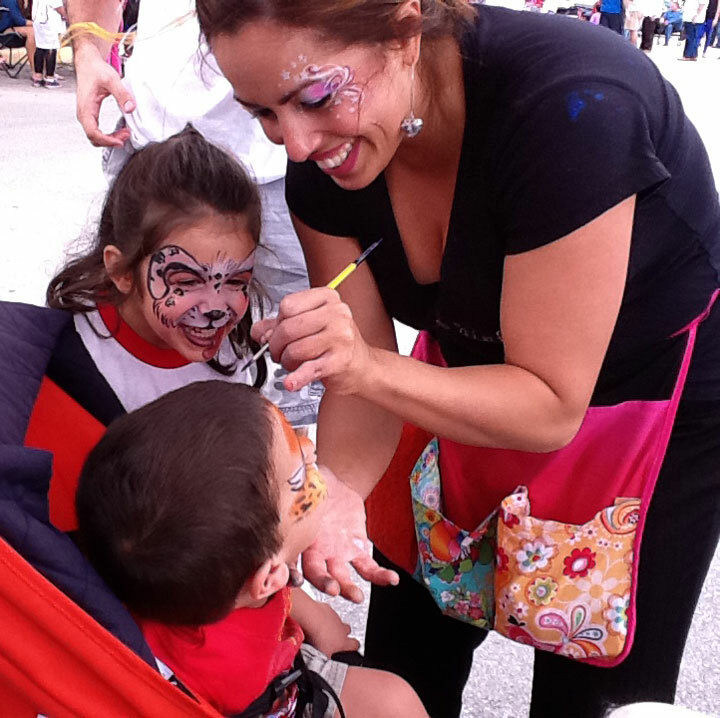 Margi is not only a great friend, but she is a mother of three and still has time to teach face painting workshops, release new books, and teach LIVE classes! She is a bundle of energy! Margi has released a series of face painting books focusing on the art of animating painted faces. You can pick up a copy of her latest book, Pick Your Nose Vol. 3, over at Silly Farm Supplies! FABAtv is your online destination for face and body art classes. 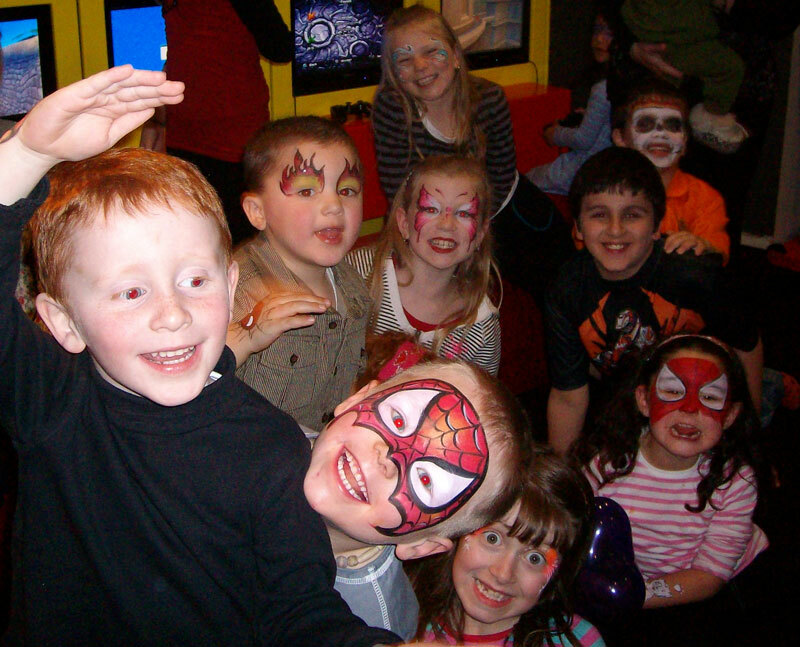 Whether you are new to face painting, a professional body painter, or even a magician, FABAtv has classes you want to watch. Take a class from the comfort of your own living room with fantastic instructors like Mark Reid, Lynne Jamieson, or how about Nix Herrera who was on Season 2 of Syfy’s hit reality show, FaceOff. Not quite ready for a subscription? Not to worry! FABAtv has been satisfying the urge to learn of face and body painters everywhere for over a year now with free & live classes every month! July’s live class is being hosted by face & body painter, Tina Carroll! Tina Carroll has been body painting for over 13 years and runs Transformations by Tina, offering her services in face painting, body painting, glitter tattoos, and henna to the Northern Virginia, Maryland, and Washington D.C. areas. Tina’s work has been featured on several face and body art magazines, as well as being featured on the Fox 9 news in Minneapolis. She currently is working with face paint brand Snazaroo to release a face painting book sometime in the future. Tune in to FABAtv LIVE on July 15th at 8PM EST for this free class on face and body art! Don’t miss it! Face and Body Art Television (FABAtv) is a subscription based, educational website for face and body artists. 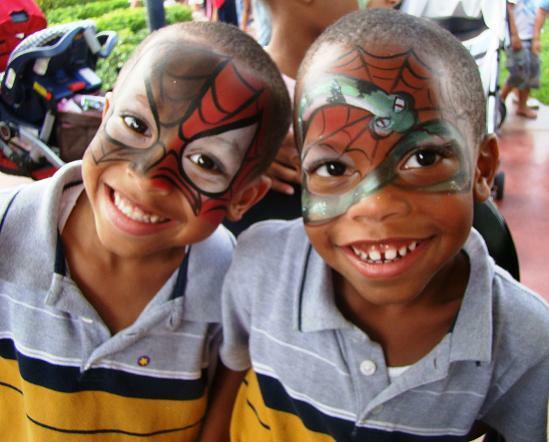 FABAtv has classes on face painting, body art, airbrushing, henna, and more! Once a month FABAtv hosts a free and live class from one of our many instructors. Take your body art to the next level with FABAtv and subscribe today! Our featured FABAtv LIVE class for the month of May is Australian painter, Annie Reynolds! Her company, ACA Larrikans Entertainment, has been providing quality entertainment and body art around Sydney, Australia for over 13 years. Since she started to paint, Annie decided she wanted her paintings to be as good as her mentors Lynne Jamieson and Jinny MUA. After watching her paint amazing masterpieces, it was evident that Annie had already accomplished her goal. Her unique style of painting combined with her bubbly and enthusiastic personality has made her a perfect candidate to teach in the Face and Body Art International Convention. Annie’s other talents includes acting, singing and being a hairdresser. Tune in May 15th starting at 8:00pm EST for this FREE & LIVE class on body painting with Annie Reynolds! Alex Hansen is an accomplished artist for body painting, airbrush and special effects. He has competed numerous times winning multiple awards all over, and has done special effects work in movies, such as 300 and Death Race. We’re excited to announce that FABAtv is bringing him to South Florida for a FREE LIVE class! That’s right. FREE. 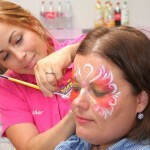 Each month FABAtv hosts an entirely free, live class on face painting, body art, magic, balloons and more! Tune in April 15th at 8PM EST to watch Alex Hansen and his class on Bones & Muscle Structure in body art. We were able to catch Alex away from his busy life to share some details about himself and his journey as an artist. Q: Tell us a little about yourself, where are you from? Q: Are you an artist full time or do you have another job? Q: What type of face and body art do you specialize in? Q: How did you get your start(in face and body art)? Q: What’s the most enjoyable part of what you do? Q: Do you attend any conventions, like the FABAIC? Q: What would you like to do more of, art or otherwise? AH: Well art is my life…. being a great family man is what I love the most, besides that what else is there? Q: Outside of art, what do you do for fun? Q: Do you have any pet peeves? AH: Well I have three…. Stupidity, tardiness and egos! Q: Where do you see yourself in a couple years? Q: Do you have any projects going on or in the works? Q: What do you think of FABAtv? AH: Well I think it is a great idea…. but I also believe you can never get the same effect with a teacher in person!! As great as FABAtv is, Alex is right. You can’t beat a LIVE instructor! So be sure to tune in for his LIVE class Bones & Muscle Structure, and get a chance to ask him your questions LIVE! Well, now you know a bit more about this talented artist. His services include and are available for editorials, television/film/video productions, photo shoots, trade shows, workshops, fashion shows, special occasions, promotions, events, and live performances. If you want to reach Alex, he is available by email or facebook. FABAtv is ‘Face and Body Art Television’. An online video classroom that allows you to learn side-by-side industry professionals all from the comfort of your own home! Don’t have the time at home? Kick it up on the go and watch your favorite instructors from your smart phone or tablet! FABAtv has classes from artists all around the world, covering face painting, body art, airbrushing, balloons, makeup, magic and more! What are you waiting for? Go check out what you’ve been missing on FABAtv.com! FABAtv hosts a FREE class online every month. The artist for March’s LIVE class is Miss Sparkles Smith! Not only is Miss Sparkles a balloon artist, she is a face painter as well! Balloons are just part of the extra services she can offer her clients, and they are always a hit with kids! Don’t miss this free class on March 14th starting at 8pm est! On Monday we’ll post an exclusive interview with Miss Sparkles and get to know her, but until then have a great weekend! FABAtv.com is your online resource to watch unlimited face and body art classes in crystal clear HD. Learn from the masters of makeup, special effects, body art and more right from the comfort of your own home. All you need is a high speed internet connection! FABAtv also hosts a free & LIVE class every month. Tune in on February 13th at 8:00pm est for this months LIVE class! This live class will be featuring master body painter, Marcio Karam! A painter for over 13 years, Marcio has painted cars, boats, bikes, murals and more. Skin is not his only canvas! Check out his work to the side and below. Visit his website at MKArts.com for more works of art or to contact Marcio. So tune in to this free class and support your industry! This live class is available to watch for free through the FABAtv website on February 13th starting at 8:00pm EST! 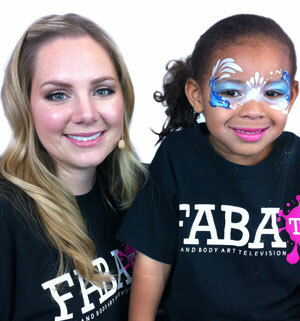 FABAtv is face and body art television, a leader in the education of this fine art. Using state of the art technology, FABAtv is able to bring you classes in stunning High Definition videos straight to your smart phone, tablet, or other web-enabled device. Where else is learning at your finger tips with hundreds of HD video classes from international makeup artists, face & body painters, airbrush artists and more! Up until February 6th FABAtv is letting you watch ‘Magic of Glitter Powders’ absolutely free! Head over to their facebook page to find out how. 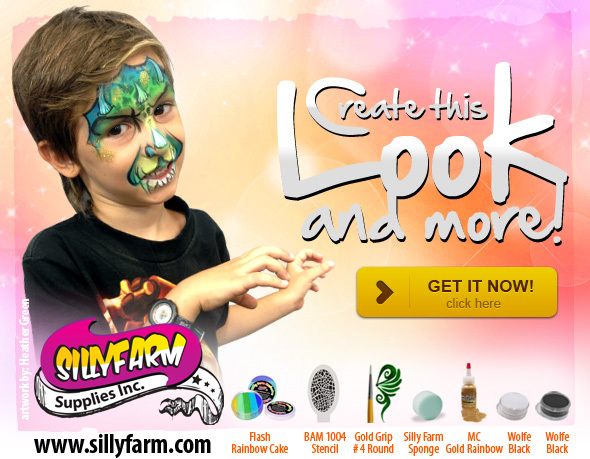 Win a free Silly Farm Brush Set or FABAtv Subscription! There’s a million different contests and surveys going on around the world wide web as we speak, but only one contest will matter to YOU. Here’s your chance to win a free Silly Farm Signature Brush Set or a free month subscription to FABAtv with the latest Silly Farm contest. Silly Farm Supplies is hosting a photo contest on their facebook page, and it’s easy to be a part of it! Grab your paints and get ready, because submissions to this contest are now open! 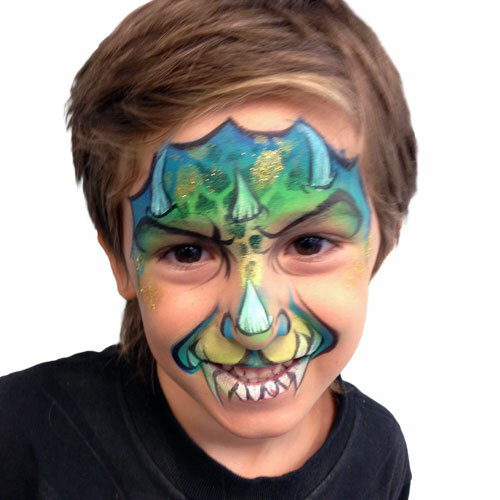 Paint up your best tiger face painting design with all the bells and whistles you can muster. Snap a clean, in-focus picture of the completed design. Submit the photo of your design as an official entry to the contest. The official contest page can be found here on the Silly Farm Facebook. This contest is fan-focused and voting runs from January 15th through the 21st. Winners will be announced after the 21st of January and will be contacted by email. Enjoy the contest! Leave a comment below and tell us what you would like to see as a future contest or prize. FABAtv.com is an online face & body art classroom at the palm of your hands. A first in the industry, FABAtv brings one-on-one classroom oriented teaching right to the comfort of your own home. All you need is a high-speed internet connection and a web-enabled device, and you have hundreds of classes on face painting, body painting, airbrush art, and more at your fingertips! FABAtv premieres a FREE & LIVE class every month. Starting off 2013 with a bang, this month’s LIVE artist is Canadian face painting sensation Léa Selley! You might of seen some of her YouTube videos under her alias, The Tattooed Lady. Below is a sample tutorial of what Léa will be teaching in this upcoming class. Tune in to FABAtv LIVE at 8pm EST on Tuesday, January 15th and catch Graffiti Eyes with Léa Selley, only on FABAtv.com. You can find Léa Selley on Facebook, or contact her through her website, www.thetattooedlady.ca. Read more about Léa and her class on The Tattooed Lady’s blog. Like the tutorial? Buy the Graffiti Spatter Stencil from Léa and save time face painting! FABAtv (Face and Body Art Television) is feeling the Holiday spirit this winter. 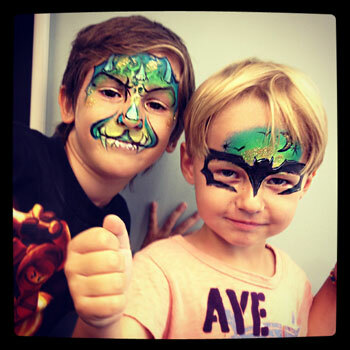 If you’re a subscriber to FABAtv, you’ve probably seen the free face painting class they are offering this month. Unlike the usual free & live class that FABAtv hosts around the 15th every month, this is an actual studio-filmed-and-edited class. 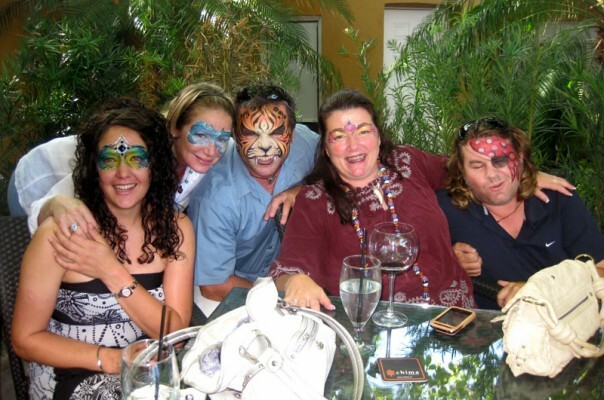 The artist behind this free face painting class is Heather Green, aka Silly Heather. Many of you have know of Heather as the owner of Silly Farm Supplies and from her YouTube face painting tutorials. Her latest class is all about Christmas and Holiday designs. You can catch Heather’s free class, Holly Jolly Christmas, on fabatv.com throughout the month of December! Genevieve Houle, who the world has come to know as Jinny Makeup Artiste, is a world renowned face and body artist. Co-creator of the Paradise Makeup AQ™, Jinny has traveled the world, teaching & performing her art for international media, shows, commercials and more. Jinny is widely recognized for not only her ability to paint amazing pieces of art, but to objectively critique and advise artists of all talent levels. She has previously been a judge at the World Body Painting Festival in Austria and at the Face and Body Art International Convention in the USA. Jinny is an active instructor, always willing to share her passion with others. Occasionally she puts out free tutorials through her youtube channel, but this week she will be traveling to South Florida to film a couple brand new classes for FABAtv! On Thursday, December 13th, Jinny will also be teaching an entirely FREE face and body art class through FABAtv LIVE! Tune in December 13th at 8pm EST for this hour long class on Quick & Wow Body Art! I hope everyone had an amazing Thanksgiving this weekend, however you spent it( with or without family and friends). For those that worked Black Friday and Small Business Saturday, I hope you’re getting some well deserved rest. I wasn’t able to push this tutorial out before Thanksgiving, but I’m here now and delivering it today. 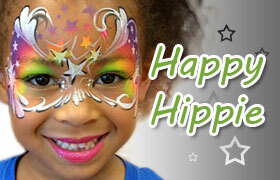 This is Heather’s latest face painting tutorial, aptly named ‘Happy Hippie’ for it’s free flowing nature. This is a quick 3-5 minute design that pops without spending too much time on detail. Heather started this design with the brand new, Silly Farm Exclusive Hippie Rainbow Cake. Using a sponge and the BAM 1038 stencil, she started the base on the forehead and then filled around the eyes with just the sponge. Next, Heather used an Athena #10 Filbert brush and Wolfe White to hand paint a couple more stars and add some strokes above and below the eyes. Heather then dabbed her sponge in Wolfe White and using the BAM 1038 stencil again, dabs some stars over the Rainbow Cake base on each side. Next, Heather takes her Gold Grip #4 round brush loaded with Wolfe White and adds some more details around the design. Depending if you have the time or not, Heather used a Gold Grip #2 brush loaded with Wolfe Black to outline parts of the design. Finally, Heather added some ‘lipstick’ and some Magic Magenta & White Fairy Dust glitter for the finished design. The tutorial is below, along with the products used. 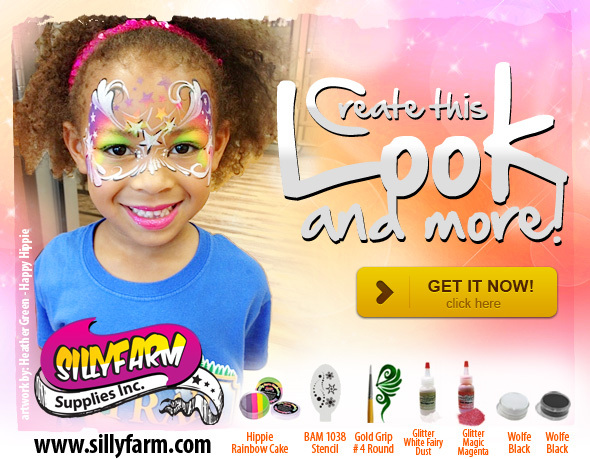 You can visit Silly Farm’s Create This Look section to see all the products used in each design. We’re sure some of you will recognize this tutorial. Lisa Joy Young’s youtube has quickly spread through-out the face painting world as one of the go-to channels for design ideas and tutorials. If you can’t get enough of Lisa from her Youtube tutorials, don’t forget that she is a FABAtv Instructor and has two classes out and more on the way! Here’s one of her latest tutorials, a witch hat with spider webs in the background. This is a great design that can be used on kids or adults for your next Halloween gig! This article is a submission from Artist Alley. Click here to view it on Artist Alley. When you’re just getting your business started, the onslaught of expenses can be staggering. After all, it takes money to make money – right? Definitely…but sometimes the best things in life are FREE! Every new business needs a website, which I found to be one of my most daunting tasks. Web designers are expensive, and it’s easy to get taken advantage of when you don’t know much about web development. Check out our last article about websites and you’ll be well on your way to getting started for free, with minimal technical knowledge. Business cards are an absolute essential for networking; you never know where you’ll be when someone asks for your information. Pulling out a stylish business card looks much more professional than scrambling to jot down your number on some scrap paper you found in your purse. 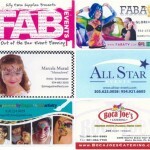 Vista Print and Zazzle both offer free business cards, with plenty of design templates to choose from. If your business involves selling merchandise, check out the United States Postal Service‘s array of free shipping supplies. You can “purchase” your supplies online, and have it shipped right to your door. The education process is endless. You may have already “learned” your trade, but keeping up with the latest trends and techniques takes some serious dedication. While I recommend saving up for workshops and conventions, it’s understandably expensive. Keep your skills fresh between classes by dabbling around on Youtube; there’s tutorials for everything from cheek art to prosthetics, henna, and more. Some of the biggest names in face & body art keep active channels, full of advice and tutorials. Check out Silly Heather and Jinny for starts! Even with all of the right supplies and talent, a small business can fizzle out if you’re not prepared for the management end of things. SCORE (Service Corps of Retired Executives) is a nonprofit consulting service for entrepreneurs to help you build your business from a solid foundation. In addition to their free business counseling services, they host low cost workshops and webinars. Managing your money and resources from the start will afford you more success in the long run. Fancy business cards and high end websites are great, but pace yourself! Grow your business thoughtfully; every penny matters. Everyone always asks for more boy designs, so we’re dedicated October to boy designs! This is a quick batman inspired face painting mask that I created and can be done in a quick 3-5 minutes. Add your own variations or copy it line to line! The model requested that I didn’t paint over his eyes so I created the mask around his eyes without making him close his eyes during the process. I start off laying down background color with my rainbow cake, and then painted the mask on top and around his eyes. I added the details, some tiny bats and a moon. I finished the design off with a little glitter and VOILA! A fast and simple design geared towards all ages! Watch the Dark Bat tutorial on Youtube. Want the tutorial for this other design? Find out how to create the ‘Dragontales’ design! With the ease and availability of search engines, the World Wide Web has become a cornerstone directory of information. And you – as an upstanding professional artist – should be on it! People want to know about you before they promise you money: They want to read about you, find great reviews, and scope you out a little bit before allowing you into their homes. Now, I am not the most tech savvy person. My initial foray into website building was long, laborious, and fraught with disappointments. Hiring a reliable web developer on a budget seemed impossible, so I joined the ranks of DIY’ers (Do-It-Yourself’ers). Here are some of my favorite website building resources and tools – designed specifically for the tech-illiterate! Wix – A drag-n-drop style editor for beautiful Flash or HTML5 websites. Carbonmade – Focuses on creating sleek, stylish, online portfolios. WordPress – A very SEO (search engine optimized) option, based on a core “theme”, customized by the addition or deletion of “plug-ins”. Godaddy – Offers free design templates, pre-made websites, and a website builder with a slew of additional tools. Blogs, such as Tumblr or Blogspot, also allow you to add pages and connect to a domain name of your choice, giving the benefits of a website with minimal effort. Most of these allow you to build your website for free, only charging you if you choose to upgrade to a higher package. Freebies are great for the nonexistent budget of a budding entrepreneur…however, I have found that upgrading to a paying package has been well worth the professional appeal it offers. From there you can always expand. Adding additional pages, comment widgets, interactive Google maps, or payment integration, is much easier than you’d think! Look at the design and layout of other successful websites for some inspiration. FABAIC, WolfeFX, Kryolan, and Mehron all fit the bill. All logos are intellectual rights and trademark of their respective owners. 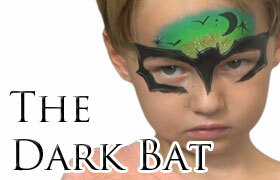 Everyone has been asking for more face painting designs you can use on boys. This is a cute, dinosaur inspired design that is sure to please the boys. This design can be done within 3-5 minutes and is perfect for when the boys want something mean and green! I started by sponging on my base coat using my Flash Rainbow Cake, available at Silly Farm Supplies. Some quick edge work with a brush while still using my Flash Rainbow Cake allowed me to detail the forehead more and add my dinosaur shape. Next I used my BAM Stencil #1004 for some quick detail, and then I started to outline the teeth and horns in white using a Gold Grip #4. I added some depth by bringing out the eyebrows more and was able to quickly add more depth by outlining the design with Wolfe Black. I’ll add some gold on my sponge and use my Bam Stencil again to place some spots. Of course I always need glitter, so I’ll use my finger and dab some Mama Clown Rainbow Glitter on. Ta-da! Silly Farm Supplies and FABAtv are hosting a Paint-A-Thon fundraiser on July 23rd, 2012 starting at 3:00pm EST for Brian Wolfe. Brian has been an influential part of the face and body art industry and has been diagnosed with Pancreatic cancer. Heather wrote an article about Brian Wolfe earlier in the week, please check it out and if you are able, please donate to help Brian’s fight. Remember to tune in for seven (7) hours of LIVE and FREE face and body art classes! A lot of us are transfixed by the current economic situation and are allowing it to bringing us down, and forget the things that exist in our lives that can do a lot of good without having to give a lot. Happiness is FREE! If you take an hour out of your day to send an email wishing someone a happy birthday, tell your parents or kids that you love them, pass along a compliment, pay for a friend’s toll, or just give a friend in need a hug; Your happiness could inspire a change of heart, grab you a booking, rekindle a friendship, or even just bring a smile to someone in need. Life is not about waiting for the storms to pass… It’s about learning how to dance in the rain! Slow times are an incentive for working on your marketing skills, creating portfolios that impress, investing time in your business, networking and doing the things we don’t have time to do when we are too busy. If your business is slow, try not to spend too much time worrying, but instead prepare to enjoy the rainbows that naturally follow the storms.